on a milkweed plant in the nearby town of Guilford. They are communal feeders with little to worry about calling attention to themselves. In fact, they are "designed" to be seen. The sharply contrasting orange, black and white coloration is a warning to avian predators that they are toxic. What good would it do them if they were accidentally mistaken for something edible? There is another well known lepidoptera whose larvae feed upon this plant - the Monarch. 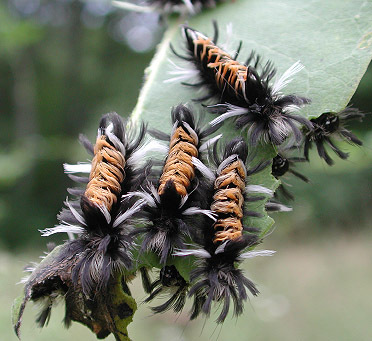 The adult wears the same warning colors as the moth larvae that share this host plant. If a bird were to swallow a milkweed-filled caterpillar, if it didn't immediately regurgitate it (which it normally does), it would stand a good chance of dying of a "heart attack". The adult moths are relatively drab on the outside, but have a colorful orange abdomen. There are nice photos of one here at Lynn Scott's site.